St Stanislaus was born an only child to a noble and wealthy family in Szczepanow, Poland. He received a good education in his homeland (Gniezno) and also abroad. St Stanislaus was ordained a Priest and, aged 42, was elected Bishop of Krakow. Initially, he refused the role of Bishop but on the instruction of the Pope, he accepted. 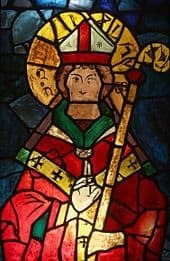 Following disputes with the then King Boleslaw over land and the Kings own moral behaviour, St Stanislaus was sentenced to death. When soldiers refused to execute him, King Boleslaw personally did so. Pope John Paul II referred to St Stanislaus as ‘the Patron Saint of moral order’. St Stanislaus’ Feast Day is 11th April. He is the Patron Saint of Poland, Kraków and moral order. Pray for us that our behaviour will respect the moral teachings of the Gospel.